A mobile money transaction platform was developed for a digital enterprise based in Europe. They offer various banking and financial transaction management services. The solution is built using Microsoft Azure and Xamarin cross platform application development technology. With increasing penetration of mobile technologies in global economies, mobile money continues to grow: today 100 new services plan to launch cashless services all around the world. There is also a high demand observed from consumers using digital wallets. One of the major problems faced is digitally transferring money from mobile wallets to people around the globe. There are many mobile money platforms available, but they lack the necessary functionality and capacity to serve the rising demand. The client wanted to address this problem and build a custom money transaction platform which can simplify currency distribution to its global users. The solution had to be scalable, intuitive and meet the global compliance norms for fraud detection, tax evasion and anti-money laundering. Rishabh Software’s team developed the customized money transfer solution using Microsoft Azure and Xamarin cross platform application development. The development focus was on building a centrally-hosted transaction platform which manages the fund transfer transactions, using secure & available third party solutions for payment processing & fund transfer. 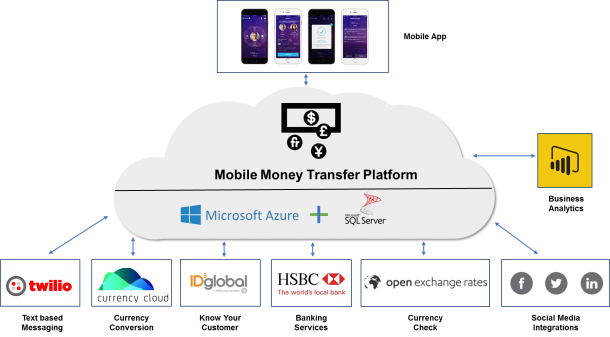 Apart from leveraging dot net development services, cross-platform money transfer apps were created for iOS, Android and Windows phones using Xamarin and Azure. We also integrated services like KYC (Know Your Customer), AML (Anti-money Laundering) & Currency cloud to meet the global compliance laws. The solution was built in a planned phase manner, starting with a “Proof of Concept” to test and validate market acceptance of the proposed concept to developing the final platform. Europe based digital enterprise providing banking and financial management services. Get a Free QuoteTalk to our experts to get help with building a custom money transfer application.